So how does someone use group policy to manage these settings that used to be in the main registry? this change is transparent for extensions (DLLs) that run in the devenv.exe process. May you provide more detail on this? Can you give an example? Thanks very much. 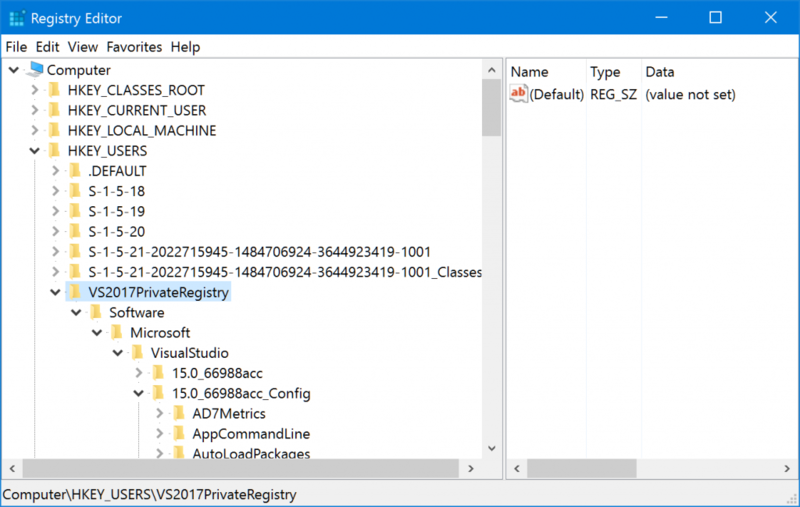 Since Registry redirections are set at process-level (the devenv.exe process), any extension, which is a dll loaded in the devenv.exe process, gets the Registry redirected too, without any further action. So your extension (dll) can read from HKEY_LOCAL_MACHINE\SOFTWARE\WOW6432Node\Microsoft\VisualStudio\… and it doesn’t know if it is actually reading from HKEY_CURRENT_USER (VS 2010-2015) of from the private registry file (VS 2017): it is transparent.